Are Karate Lessons For You? A Las Vegas Karate School is named Top School In Nevada by Martial Arts Magazine. Along with the top 200 schools in the country and making this the best school in Las Vegas and Henderson Nv, Professional Karate Centers, under the teaching guidance of Grand Master Allen Sarac, is one of the oldest schools in Nevada. Hi, I'm Allen Sarac. You may be here because you have many questions about beginning martial arts training, or are already interested or enrolled and are looking for information. In either case, Welcome! Although Stamina and Endurance may sound similar, the difference is important in achieving your goals as described by this Grandmaster of the martial arts. 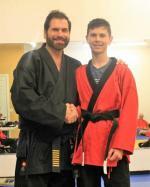 Allen Sarac's Professional Karate Center is Clark County's premiere school of Martial Arts. Chief Instructor and World Champion, 8th Degree Black Belt Grand Master Allen Sarac and his team of certified Instructors bring over 38 years of teaching experience to our family of students. 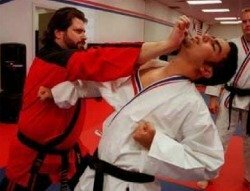 Whether your are totally new to the Martial Arts, experienced, adult or child, Professional Karate Centers offers a comprehensive program to develop your body, mind, self defense skills and good character. Each Belt Rank Test has a requirement for Community Service projects. The martial artist is more than a weapon of self defense. Learn why our students become better citizens and not bully's by learning empathy and involvement. Belt Rank Test Time, a joy and a tangled web of nerves. Learn why its required and why you want to test. Should you enter a karate tournament? Why should you enter a martial arts tournament? We answer those questions for you. Read Tips and Techniques from our Students inside our website! Jokes Sent From Students. Send yours here, too. Which Martial Arts School is Right for You? Whether for fun, sport, to instill an improved sense of discipline or serious self defense ask yourself some important questions when looking for a Las Vegas Martial Arts School (or anywhere). What Set's Allen Sarac's Professional Karate Center Apart? Allen Sarac's Professional Karate Center's offer a unique and effective blend of traditional values and modern effective Martial Arts techniques that not only will develop you and/or your child as an individual, but also develop simple and highly useful self-defense skills, which are essential in today's world. Additionally, our Las Vegas karate school offers a proven and effective method of training administered by our professional staff. There is a comfortable viewing area with full color monitors so that parents can observe the class. We want to introduce some of our family of students to you. Notice that we use the word family. We use this word because that is how we view our school and our students. In our family we have a combination of children, adolescents and adults at all different levels of skill and rank. Everybody (even Master Sarac) started out as a white belt, excited, nervous and knowing very little or nothing about what we do. How did he (or anyone else for that matter) get to a high level of skill and competence? The answer is that he had a good Instructor and he had his more experienced brother and sister students. We encourage this attitude of family with school parties for adults and children, Inner-School Tournaments, and many other events and activities. As one of the world's few Song Moo Kwan Grand Masters, Allen Sarac has a wealth of information on Martial Arts. As this information is gathered and placed into our website, you may use it to better understand "The Ever Youthful House Of Martial Arts Training"
Enter Your Name and e-mail address below and check out a copy of our newsletter. 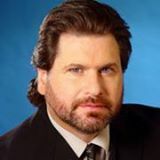 You'll get occasional tips, event notices, internet deals and training videos... all FREE ! For over 30 years men, women and children have been training and enjoying the martial arts by Grand Master Allen Sarac and his dedicated team at Professional Karate Centers. The art of karate, self defense, confidence, character, mannerisms, exercise and stress relief are just some of the benefits that over 6,000 students have been trained in. Would you like to experience karate classes in Las Vegas or Henderson Nevada? 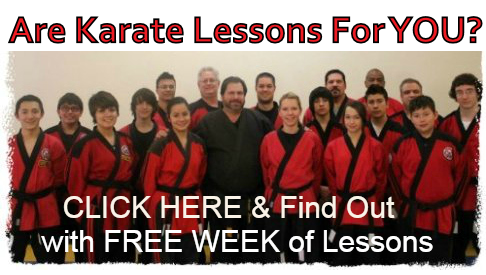 Try this Exclusive LVKarate.com Special: A FREE WEEK of Lessons (not just 1 day!) to see if martial arts classes are for You! Don't Miss Our Internet Special! Subscribe to our Newsletter "Just For Kicks" Below. Thank You!